The institute continues its Brewing Up Texas exhibit programming by calling on Girls Pint Out to facilitate a discussion with women brewers, brewery owners and beer industry executives. Participants include Vera Deckard, master brewer and owner of Künstler Brewing; Erica Teague, owner and assistant brewer at Cactus Land Brewing Co.; Laura Hill, QA Manager at Spoetzl Brewery; and Glynnis Akin of Ruggedman Brewing Co.; as well as coordinators of the Girl’s Pint Out events, curators of the exhibit, and others. Additional support from San Antonio Girls Pint Out, San Antonio Women’s Chamber of Commerce, Cactus Land Brewing Co., Künstler Brewing, Ruggedman Brewing Co., and GLI Distributing. Let us know if you’ll be there — check the Facebook event page. Quality Assurance Manager at Spoetzl Brewery and have been there for 4 years. 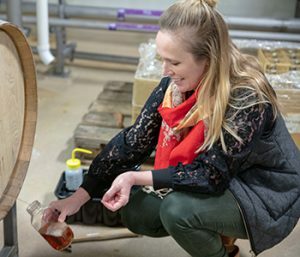 In this role, she manage all wort, beer, yeast, and packaging testing on a daily basis as well as overseeing our waste water treatment operations and working on new product development. Before that, she worked in the food industry after getting a Ph.D. in Bioengineering but jumped at the chance to work in the brewing industry. She enjoys working with all kinds of fermented foods and beverages and love getting to make beer every day. Girls Pint Out’s mission is to build a community of women who love craft beer and who are an active, contributing part of the greater craft beer community. 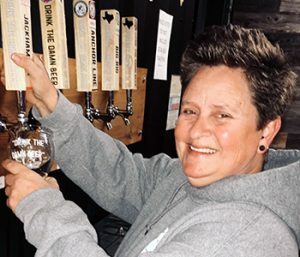 Through brewing and tasting events, beer education classes, and camaraderie like you’ve never seen, San Antonio GPO aims to provide women a fun & judgement-free zone for craft beer newbies and vets alike. Assistant brewer and beertender at Ruggedman Brewing Company in New Braunfels, Texas. Glynnis started in the brewing industry part-time 10 years ago. She is a former middle school teacher. She left teaching 5 years ago to enter the growing beer industry full time. Glynnis is a resident of San Marcos. She has a Bachelor’s in Medical Technology and a Master’s in Education. A seven-barrel craft brewery located in New Braunfels, Texas. Founded by Marine Corps veterans, the brewery takes its name from the “rugged” condition they found themselves in after months of field operations. Our mission is to provide you with a wide variety of high quality beers in our on-site taproom. We constantly rotate a wide range of beer styles to ensure that we have a beer to please everyone’s palate. We’re working hard at Ruggedman because we know how hard you work. And we’re not only here just to pour you a beer. We have an inviting taproom and knowledgeable staff to welcome you. Come learn about the wonderful world of craft beer though our events and special programs.